Under the archway at the end of the Long Market, two photographs looked down on the pedestrians as they moved through to cobbled streets of the Main Town or out to the car park by the theatre, where the Christmas Market was in full swing. 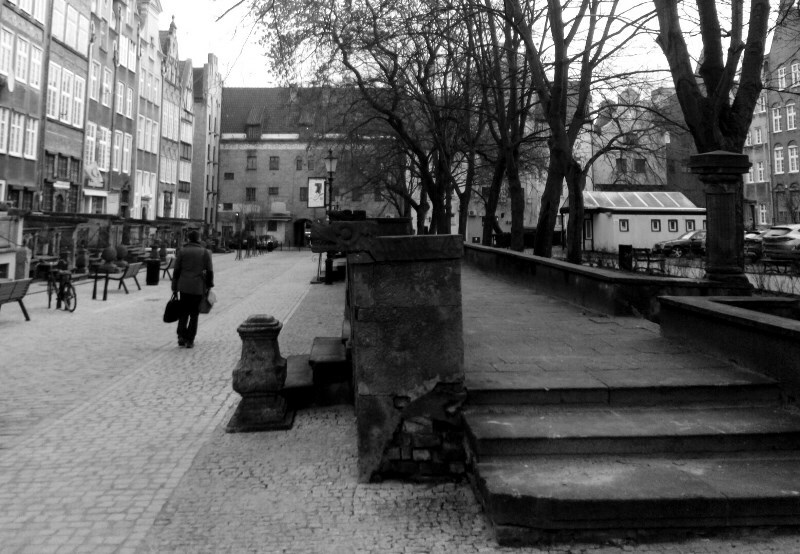 Not many people looked up, to contemplate the vision of Gdańsk as it was at the end of the Second World War. Perhaps they had seen them so many times before. But for the new arrival, they were enough to make you stop and stare. Here, in the city where the war began, roughly 90% of the buildings were destroyed. The photographs showed the devastation in brutal black and white. It was possible to make out the streets, but barely a single building survived intact. What remained were the stone steps, leading up from the street to where once elegant townhouses stood, now reduced to piles of rubble. The rebuilding of Gdańsk was an incredible achievement, the Main Town of the city once again reflecting the Hanseatic heyday of this port city that would later come to symbolise the opposition of everyday people to the Communist elites via the Solidarity movement born in the shipyards. On the waterfront or along the Long Market, in front of the grand churches or the amber shops of the atmospheric Ulica Mariacka, the rebuilding made it possible to imagine a city where the war never happened; even with the knowledge that behind those façades, so true to the originals, were buildings of a much more modern construction. Elsewhere in the city, the reminders of what happened in Gdańsk in the 20th century were easier to discover. The Old Town, to the north, was a fairly nondescript residential district, with only a few pre-War buildings, such as the iconic Post Office, still standing or rebuilt. There were many memorials, of course. To the Post Office workers who held out against the German forces. To the victims of the Second World War and the Communist regime that followed. There were museums seemingly around every corner, trying to tell the story of the city via the many events that shaped it and the different periods of its long history. Kashubia and Poland. Hanseatic League and Teutonic Knights. Prussia and Germany. But perhaps the most striking reminder of the past appeared back in the Main Town, on Świętego Ducha. There, on one side of the street, the houses had been rebuilt as elsewhere. Red brick and ornate façades. Crow-stepped gables and Dutch-inspired roofs. But on the other side of the cobblestoned street, the space had been left empty when the rebuilding began, eventually filled a little by trees, a car park and a public toilet, standing in the shade. On that side of the street the steps that survived the war lead up from the pavement to only the memory of the building that stood there before. A ghostly entranceway to a city almost completely destroyed, now re-imagined. The steps were like a postcard from the past, enough to stop you in your tracks – just like the photographs, hanging beneath the city gate.